Video and Voice communications may be common now but there was a time when people had to communicate with only dots and dashes. It was called Morse Code. The only times most of us will see it now are on TV with War or Cowboy movies when they use the radio to contact the troops or using the telegraph. Knowledge of Morse Code is required to pass a Ham Radio license. It is quite easy to learn. Visit Learn Morse Code and learn its secrets in under a minute. 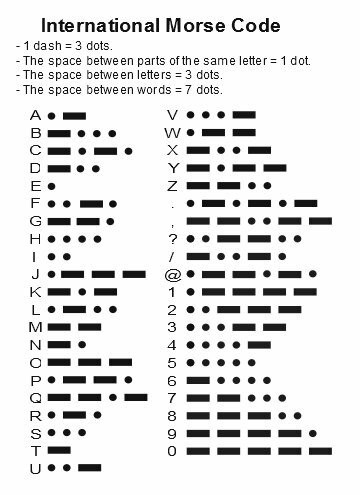 Download a copy of the Learn Morse Code Sheets. Incorrect SD: Morse code no longer has to be learned for any grade of UK amateur radio license. A license is only of any value before the major event. Afterwards there will be no one to police radio usage and it will be a free-for all. Morse code is probably the most effective communications language for long range, and noisy operating conditions. Using just 5w power simple home made equipment can establish reliable world wide communications. Anyone can purchase Amateur radio equipment, and anyone can listen to radio signals using that equipment. No license is required for owning the equipment, only for transmitting with it. Very interesting. I may even get a license now depending on the total cost. How much are they to train for, take the test and the license? Do you still need to know morse? I’ll update the article and change the wording to reflect that. Local radio clubs often run training sessions, often free of charge. RSGB sell a booklet entitled “Foundation Now” that covers absolutely the whole course, so you could self train. It costs GBP 15.00 I think. Really it is not too complex, young people of 10 years old quite often pass. There is absolutely no requirement to know or learn Morse Code. Thanks for that. It must be worth considering. It is possible to communicate globally using home constructed kit radios costing from as little as GBP 8.20!!! The kits are tiny too, many will fit into Altoids mint tins and run off of either 9v or 12 v supplies. With a small reel of thin wire they can be included in Bug out Bag contents. They are especially effective when deployed in the field. If you’re interested in using morse code as a communicating method the kits below might be intersting? $ 35.00 inc shipping: Go for 20m (14MHz) version. 0.5w CW ( Morse Code) Receiver and transmitter. 0.2w CW ( Morse Code) Receiver and transmitter. Crystals to control the operating frequency have to be purchased separately. $ 2.75 each or $ 14.95 for a pack of 7 different frequencies. Very interesting. A lot cheaper than what I was looking at.